Lyn and Vixx's Leo Unite for "Blossom Tears"
After songs from Vixx & Okdal and Seo In-guk with Verbal Jint, Jellyfish Entertainment continues its Y.Bird from Jellyfish Island series of collaborations with a light yet sad ballad. 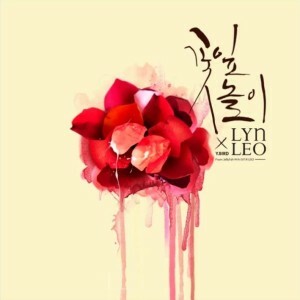 Following the release of her 8th studio album, veteran singer Lyn pairs with Vixx vocalist Leo to give us “Blossom Tears,” a song about love and denial. Seasoned vocalist that she is, Lyn effortlessly brings to life her words of heartbreak. They are carried by a guitar-driven melody, before the strings and piano take over for the chorus. The marching drum introduces tension, which is maintained by the percussion until the vocals crescendo and release it in the chorus. Leo also does a good job with his parts, though Lyn is clearly the star; her skill and experience help to lift the song, while Leo provides solid support. But while Lyn may have taken over the audio, Leo does get a chance to rule the visual. The music video features Leo as a focused and dedicated dressmaker working and living with his girlfriend, played by Korea’s Next Top Model alumna Go So-hyun (who was also in BTS‘ “Boy In Luv”). She is affectionate towards Leo, but he lashes out violently when her attention becomes too much to handle. This opening scene shows us the nature of their relationship: she wanting to be let into his heart, and he, while truly loving her, maintaining a wary distance. There is more to Leo’s story, as we see So-hyun discover medicine pills and a mysterious gift box. Just as she is about to lift the cover and see what’s inside, though, Leo arrives and stops her. Through a flashback we learn that inside is a dress he had made for a past love, one who had left him before he could present it to her. That pain of being abandoned still lingers; when he wakes up and finds himself alone, he flies into a rage. When So-hyun returns, she is still loving, but Leo comes to a decision. This leads to So-hyun dead in the bathtub, and her heart in a jar and stored with specimens from other, past, lovers. 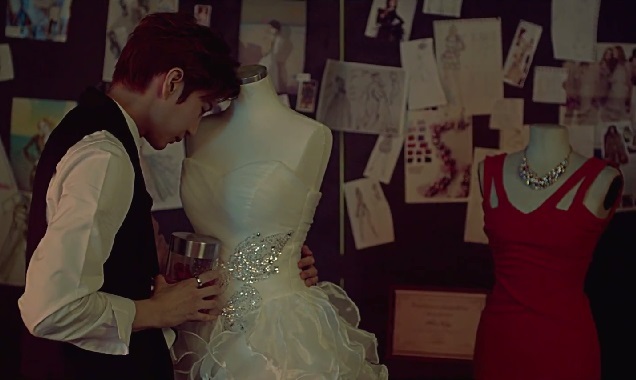 As the MV ends, we see the other dresses Leo has made, each representing a different girl. There are different interpretations to be divined from this MV, though, ultimately, the themes of pain and rejection remain the same. We can consider Leo to be a serial killer, spurred on by his past heartbreak. He’s been left with a distrust of women, one that prevents him from being more intimate with lovers, and eventually leads him to murdering them at the slightest sign of possible abandonment. The pills and jar collection are further proof of his psychosis and damaged state of mind; the pills may even have been the cause of So-hyun’s death. However, as fitting as the description may be for Leo, whose demeanour often makes ice look warm, I think this analysis could be taken even deeper, with each thing considered more metaphorically. For example, rather than seeing the pills as proof of mental illness, they can be seen as an effort made by Leo to cure his heartbreak and resulting fear of abandonment. He wants to move on and have a loving relationship with his current girlfriend, but he’s still wary of falling too deeply in love and having his heart broken all over again. The fact that he keeps the dress for the girl who left him in its box shows that he isn’t ready to accept past events; and without that acceptance, is it really possible for Leo to move forward? From what we see, the answer appears to be “no.” The dresses he makes represent the perfect memories he has of each girl and his relationship with her. He truly loves them, but is unable to cope with their independence. He grapples with this dilemma between love and fear, and ultimately “kills” the relationship, which is symbolised by the death of the girl. The dress is all that remains of happier times with each girl, while Leo’s guilt is represented by the jars he keeps hidden. Whichever way you look at it, we are shown a man who, after experiencing pain, is yet incapable of overcoming it. He has difficulty coping with reality, and prefers to dwell on memories over which he has better control. But however much he tries to deny it, he eventually cedes to the woman that he does, at the end of the day, still love.